BMS have Surveyors specifically trained in Surveying Rigs. The Rig Survey is recommended before you carry out any period of extended cruising or when your Yacht’s Rigging Wires (standing rigging) are more than a few years old. Some Insurance Companies will require that you replace your rigging wires every ten years, other Insurance companies will only continue to insure you if you have a Rig Survey. There are basically two methods of surveying the rig, with the mast stepped (standing) or un-stepped (lowered). The most effective method of surveying the rig is to un-step the mast and inspect the spars when supported horizontally on stands. This should be done periodically during the life of a sailing yacht. Interim inspections can be carried out with the rig stepped (standing). Contact us for our recommendation. Insurance companies will generally not expect a rig to be un-stepped for inspection, so at Bodrum Marine Services the Rig Survey for insurance generally involves the surveyor going up the mast (inspection from aloft). BMS carries out Rig Surveys on all types of rigs throughout the Eastern Mediterranean. We have experience in surveying spars constructed of different materials including; Aluminium alloy, carbon, wood and steel. All our surveyors are experienced, hold qualifications in marine surveying and are members of surveying organisations including; International Institute of Marine Surveying (IIMS) or The Yacht Designers and Surveyors Association (YDSA). Our rates are competitive, fill in the online survey enquiry form for a quotation. Rig surveys for yachts up to and around 12 metres or about 40 feet are normally completed within two or three hours. 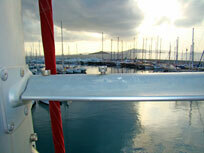 Rig Surveys on larger yachts with multiple spars are generally completed within one day. A report is provided explaining the findings of the Rig Survey. Within the report problems found during the survey are listed and information given on their importance and recommendations for repair. To receive a quote for a Rig Survey, fill in the online survey enquiry form or contact us directly with your requirements.